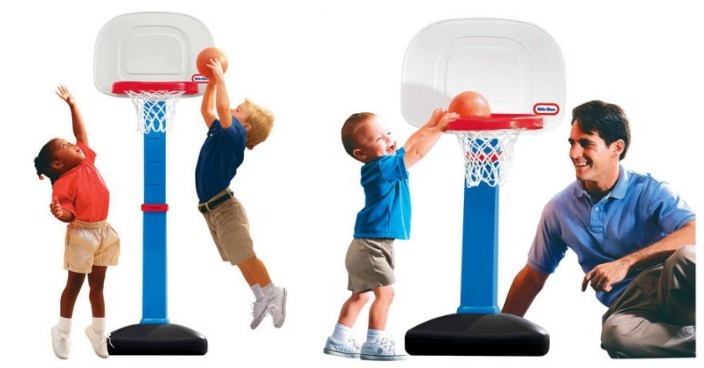 Little Tikes Easy Score Basketball Set Just $22.97! You are here: Home / Great Deals / Little Tikes Easy Score Basketball Set Just $22.97! Right now you can get this Little Tikes Easy Score Basketball Set for just $22.97 at Walmart! Get kids engaged in active play with this Little Tikes TotSports Easy Score Basketball Set. It comes with a small ball that is just the right size for those little hands. You can also inflate it if it gets flat so it is always ready to use. An oversized rim makes it easy for children to makes shots and score. Use it to teach kids about positive competition while enhancing their motor skills. It also helps to develop hand-eye coordination as they learn to make baskets. The height adjusts from 2.5′ to 4′ so you can accommodate the size of the child. As they grow or improve their skills, simply raise it to increase the challenge. Weight the base with sand before it is used to keep it from tipping over during play. This Little Tikes easy score basketball set is designed for kids aged 1-1/2 to 5 years. It comes with a user manual and the hoop.